The Memorial Bridge is a first-of-its kind structure that features an innovative and highly-efficient structural design. The bridge crosses the Piscataqua River between Kittery, Maine, and Portsmouth, New Hampshire, and consists of three spans of 300 ft. (91 m) each, with the center span being a movable lift span. This new bridge replaced the structure built in 1922. The old bridge had a long service life but was not built to handle the modern vehicles of today. The old Memorial Bridge featured a through-type Warren truss which has been used in bridge construction since the late 1800s. Rapidly build a new bridge that will have a longer lifespan and require less maintenance while also significantly enhancing the travel experience for pedestrians and cyclists. The New Hampshire Department of Transportation (NHDOT) chose the design-build approach to meet the challenges of this project. The winning proposal was submitted by the Archer Western and HNTB team. Traditional bridge designs incorporate large gusset plates at the truss nodes to connect the various chord and web elements. The Memorial project broke with tradition, however, in employing a first ever “gusset-less” design that utilizes flanges which transition smoothly from chord to web elements to provide an aesthetically-pleasing and streamlined appearance while avoiding gusset plates that would normally act as the primary sites for the initiation and propagation of corrosion and potential structural failure. The Memorial Bridge is the first truss bridge in the world fabricated without gussets. Another innovative approach applied by Canam-Bridges was the use of metallization instead of a three-coat paint system. 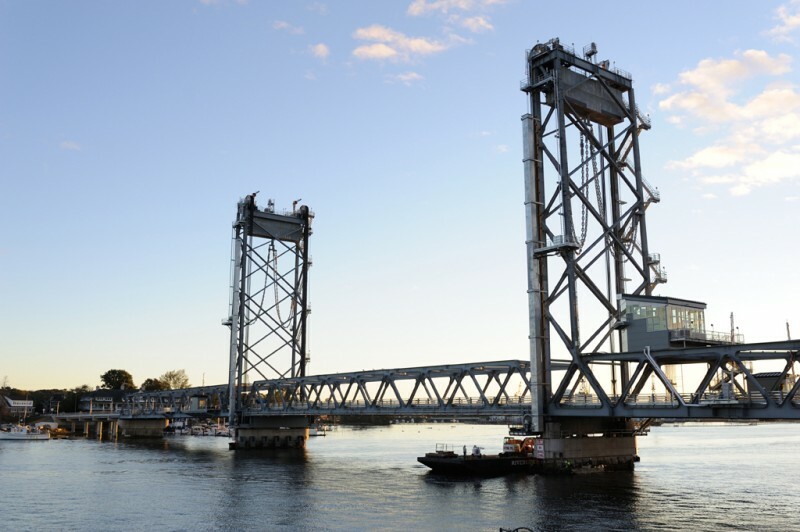 The New Memorial Bridge was the first design-build project for the State of New Hampshire as well as the first bridge to receive a metalized coating. This technique extends the service life of the bridge and reduces maintenance costs. As the designer, HNTB was looking for new ways to design trusses with a focus on transportation, fabrication, and erection as we see that these are cost drivers more than materials. Given the value of schedule to the owner, HNTB design was very much focused on speed of erection. As only one barge was to be used for float in operations, each truss had to be field assembled on a barge and was on the critical path. By eliminating gusset plates and using rolled section diagonals, we had major advantages. First and foremost, every connection for the truss (both diagonals and chords) could be made as a conventional splice with bolts in double shear. This results in a 50% reduction in bolts, and combined with interim supports at every panel point allowed for extremely rapid field erection, with cycle times in five to six weeks. We were also able to minimize waste by using the same plate thicknesses for webs and flanges (top flange of the bottom chord and bottom flange of the top chord). The more complex chord fabrication was simplified by using uniform thickness flanges bent to a constant radius, enhancing the repetitiveness of the process. The resulting truss system is more robust as diagonal damage/loss can be redistributed through the system. Additionally plate thicknesses are maximized to enhance corrosion resistance (minimum plate thickness 1”). These characteristics were keys in the design receiving the highest technical marks from the NHDOT. Canam-bridges clearly understood the design strategies employed with the truss and were able to develop and implement a fabrication process that resulted in project success. 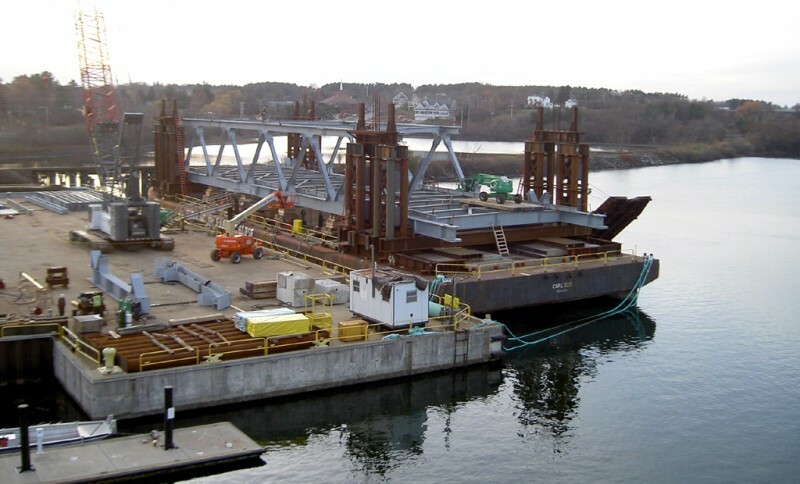 Working together with Archer Western and Canam-Bridges, HNTB was able to bring to NHDOT an innovative truss design on a remarkably aggressive schedule. This type of truss design, without gusset plate connections, represents great potential for future projects. 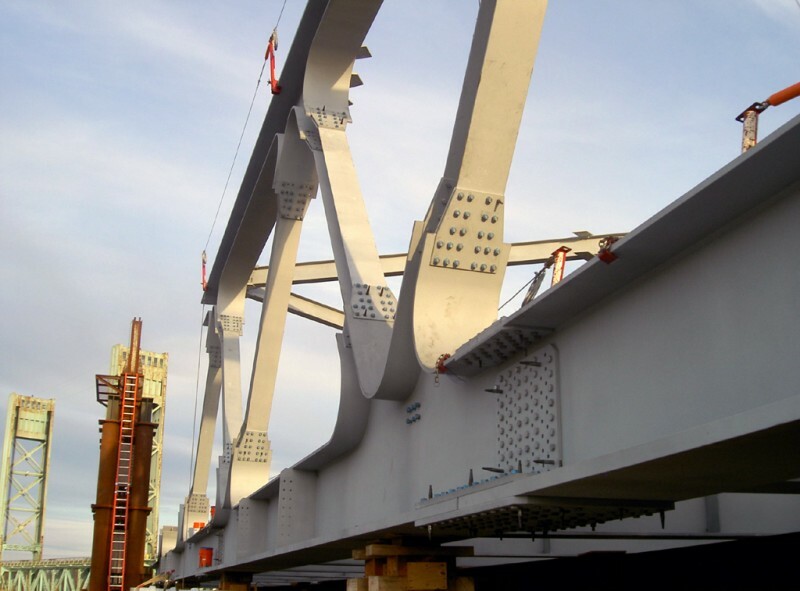 Working with the Archer Western and HNTB team toward a common objective, Canam-Bridges was able to meet the various requirements of this project and in doing so, created a better customer experience by contributing added-value in its capacity as an expert bridge fabricator. The knowhow acquired in the scope of the Memorial Bridge project has since been applied to other design-build contracts in Canam-Bridges’ project portfolio. The Memorial Bridge was inaugurated in August 2014. 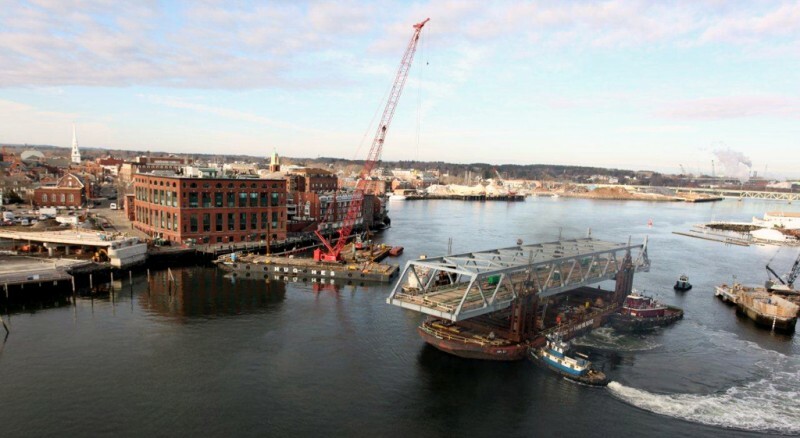 View a video of the erection of the Memorial Bridge. To view more pictures, visit the project page.